Minnesota based PayGo and California based Payment Logistics announce the release of PayGoCC powered by Paygistix ®. The FileMaker app provides a secure, future-proof credit card processing solution that handles EMV/Chip Card, NFC (Apple Pay), and Magnetic Stripe Credit Card payments. It works standalone and is easy to integrate into FileMaker applications. “The solution provides legacy point of sale systems built on the FileMaker platform a simple and elegant path to accepting the latest in payments including EMV (or chip) cards and NFC payments like Apple Pay,” said Matt Bruno, VP of Sales, Payment Logistics. Providing EMV and NFC payment options are important for both customer security and company growth. Consumers are ever more cognizant of their information’s vulnerability due to continued data breaches making the headlines. PayGoCC powered by Paygistix® helps retailers, restaurants, and an assortment of businesses accept a full range of payment types while being EMV and PCI Compliant. You can learn more about PayGoCC and its capabilities by visiting paygo.com/paygocc. PayGo is a solution provider for independent retailers based in Rochester, Minnesota. 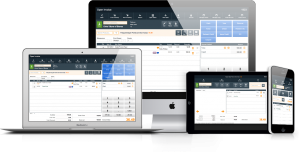 Founded in 2002, its primary focus is on point of sale / retail management software. Founded in 2003, Payment Logistics started as a full service merchant account provider and evolved into an industry leading payment technology company. Previous Previous post: Decision-making dilemmas? Point of Sale Software to the rescue!